Last night I received a question about these so called “Chrome Proofs” you see up for sale. They wanted to know if these are authentic 1/1 proofs from the manufacturer. The answer to that question in no. These were once base cards from a Bowman Chrome set, and then someone dissolved away the cardboard and what was left is the chrome front. When cleaned up it looks like a proof that came from a manufacturer, but in reality its nothing more than an altered base card made to fool collectors. These cards fit nicely into the same category as those 1/1 proofs containing the multi-colored bars. Those cards come from an uncut sheet that should have been discarded by the manufacturer but somehow found their way into the hands of a scammer who thought it would be a good idea to cut them up and try to pass them off as proofs. Manufacturers really need to find a better way of discarding the leftovers of past products so they stay out of the hands of scammers. 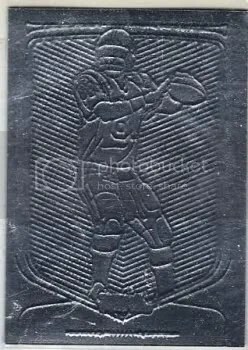 While doing a little research for this post, one of the biggest sellers of these counterfeit proofs is none other than ljbiggestfan2, who also is a huge seller of NSA “game-used” cards. For those people who defend NSA because you can’t admit you got scammed, just look at what else this person is selling. It sure doesn’t add to the credibility of NSA. Be sure to check out my other posts about NSA which have attracted a lot of attention from the collecting community.